End of the Cruise Ship dream for Dún Laoghaire? Now that Dublin Port has won final permission for a double cruise ship dock, there is no possibility that Dún Laoghaire Harbour Company’s cruise plans are viable. It sounded like such a great idea. Cruise ships would dock in Dún Laoghaire – and not just any ships; these would be the largest cruise ships in the world. They would disgorge wealthy tourists to shop and eat and revitalise our port town. The ships would pay giant berthing fees and the Harbour would regain the income it used to earn from the now defunct high-speed ferry to Holyhead. 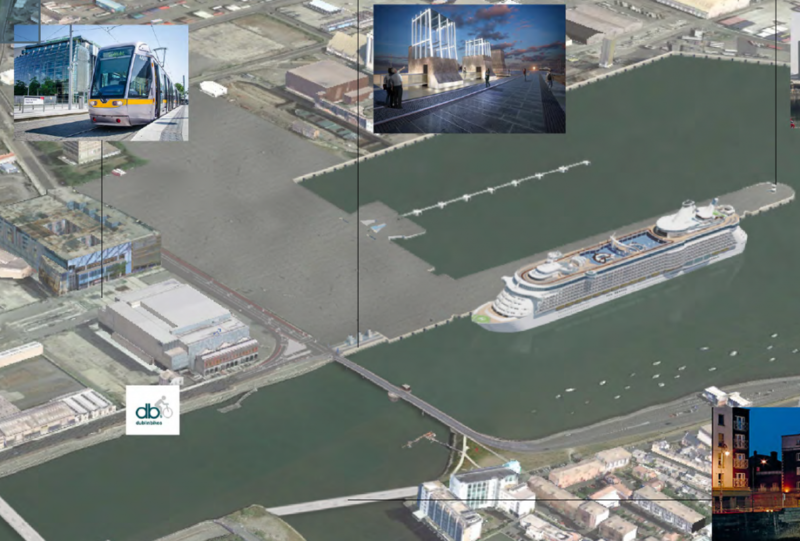 Then, in July, just after Dun Laoghaire had applied for permission, Dublin Port obtained final planning permission to construct a double dock for cruise ships next to the Point Depot and the East Link Bridge. This will have twice the capacity of Dún Laoghaire’s proposal and will bring passengers closer to the major city centre tourist attractions. It will use the same funding from the EU and from the Irish government that Dún Laoghaire had hoped to access. So, even if Dún Laoghaire obtains planning permission in a year or two from now, it is very unlikely that the project will be viable. It might seem like a disappointment for Dún Laoghaire, but Dublin Port may have saved us from a poor investment. Plenty of studies like this: Economic Contribution of Cruise Tourism to the Destination Economies have measured how much passengers spend when a cruise ship docks in a town. The passengers have free food on board so they don’t eat out in the town’s restaurants. In fact many don’t bother disembarking at all. Of those who do come ashore, most board a tour bus to visit the major national attractions: the Book of Kells, Glendalough, the Guinness Brewery. Those who walk around the town, may buy some jewelry or a small gift. So the cruise ship passengers will not be the solution to the problem of so many closed shops on Georges Street. There definitely would be a benefit to the town from the arrival of a large number of cruise passengers – it just won’t be as large a benefit as we might expect. Cobh has experience of cruise ship trade along its docks for the past few years and when I spoke to residents of the town, they told me that most passengers board tour buses to visit attractions like the Blarney stone, Fota and Cork City with a small but welcome trade for Cobh itself. The amenity value of the Harbour. The Harbour should of course try to recover its running costs from commercial activity but over the years it has developed many extra uses as a public amenity. One million people per year walk the East Pier. Three yacht clubs line the seafront with many children learning to sail every summer. Rowing, diving, swimming, boarding and other marine sports take place in the Coal Harbour and the Gut. The planned cruise ships would have been oversized for the harbour, nearly reaching the harbour mouth from the shore, creating a giant wind break and dividing the harbour in two. events in Ireland and attracts considerable business to the town from participants who stay and shop and live onshore during these events. Did it ever add up? The projected cost of the project is €18m. This covers the cost of the dock but also dredging a deep trench through the harbour which would otherwise be too shallow for these massive vessels. The Harbour company wrote a business case in 2011. A newer business case was included with the recent planning application. This includes some bizarrely optimistic assumptions. For example, every ship over 300m will choose to dock in Dun Laoghaire rather than at either of the new cruise piers in Dublin Port. It also predicts that a new cruise pier in Dun Laoghaire would attract an additional 247 vessels. Given that the season lasts at most for 180 days (April-September), attracting 247 additional vessels is far-fetched. Dún Laoghaire Harbour company does not have the reserves for this project and would have to borrow most of the capital. In their business case, they talk about a ‘secured loan’, which makes one wonder which part of the Harbour they will use as security for this project. Is the pier to be mortgaged? While Dún Laoghaire Harbour is making a loss on its operation, Dublin Port made €26m profit in 2013 and is well able to afford such a large commercial, speculative investment – with or without state funds. DL Harbour had also hoped to get funding from the EU and the state, however these bodies may be unwilling to fund two port cruise ships docks so close to one another that would effectively be competing with each other. A ship like Oasis of the Seas with 6,000 passengers and crew uses a huge quantity of diesel – up to 27,000 litres per hour. Even while idling in the port it needs to power its air conditioning and electrical systems. The ship is equivalent to a 100MW diesel power plant in the harbour and would damage local residential air quality. The above map shows the area marked in red that would require dredging to cut a channel deep enough for a cruise ship to pass through. Hundreds of thousands of cubic metres of spoil would be removed from the sea floor – along with anything alive – and then dumped elsewhere at sea. You can make a submission to An Bórd Pleanála for a fee of €50. The details of the case are listed here. This is the guide to making a submission. The deadline for submissions is 27th August 2015. Rarely do I find myself agreeing with the Green Party, so congratulations on a first. As a fifth generation DunLaoghaire native, now exiled in sunnier climes,. I find the proposal to be grotesque. It would be a remarkable folly to lumber the Harbour with massive debt and destroy the amenity by the construction of such a monstrosity on the basis of such a bizarrely optimistic business plan. One can see why there were 2 resignations of Board members of DL Harbour in the wake of this and the hare-brained Urban beach proposal! Interesting article although I think some selective quoting of figures there (particularly the bits about Dun Laoghaire charging ‘giant berthing fees’, attracting an ‘additional 247 cruise ships’) but that’s just a minor point as is the obviously inaccurate ones about major sailing events (such as the regatta) not being able to take place because of the cruise berth. Most importantly though, is the lack of any suggestion of viable alternatives. We’re all agreed that the Harbour is a wonderful amenity and we hope it will continue to be but it is a 200 year old piece of infrastructure with significant maintenance and operational costs. As a councillor, would you and your party be in favour of DLRCOCO funding these costs on an ongoing basis? Should the Yacht clubs be charged a significant percentage? The sailing schools? The RNLI? Should we put a turnstile on the pier? Lofty ideals without specific suggestions in a dismissive piece like this help nobody. The figure of 247 additional cruise ships comes from page 19 of the DKM economic impact document which is linked above and is part of the planning submission. 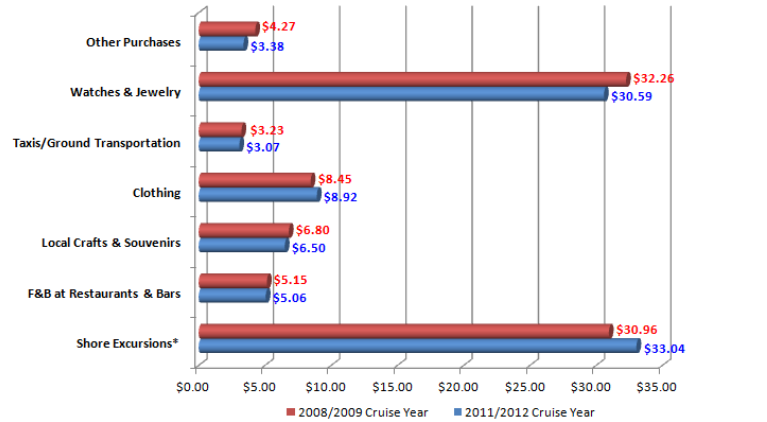 Berthing fees were estimated on page 72 of the 2011 DKM report (also linked above). This report predicted that the Harbour company would be able to collect €10 per passenger per day in berthing fees – a total of up to €50,000 per large cruise ship per day. The Harbour should try to recover its running costs from commercial activity – but this project is not commercially viable. The ownership of the Harbour is in the process of being transferred to the council. If the case arises in future that the Harbour is owned by the council and has made a deficit for the year, I would support using council revenue to meet that deficit. In the same way, large parks and leisure facilities do not always cover their costs within the county but have positive amenity benefits for the public. Which Cobh did you visit and how many business people did you talk to? Because this is NOT what the BID company found when there a few weeks ago. Please listen to this and make comment on our findings. You have taken one snippit from one person we interviewed and he goes on to qualify his statement to the contrary when he realised how close the town was to the harbour . Thank you for highlighting the details of the plans in relation to the cruise ships. 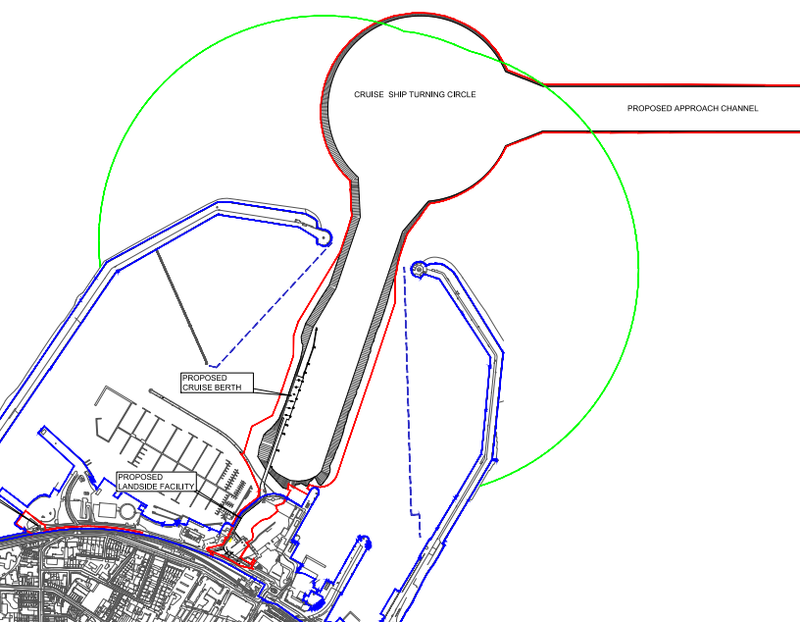 I hope that the granting of permission to construct a double dock for cruise ships at Dublin Port will mean that Dun Laoghaire Harbour’s application will be rejected; this madcap plan would be a disaster for this area. It is imperative that as many people as possible submit an objection to this proposal. Just in case the Greens missed this one . It could be possible for Dun Laoghaire to accept small cruise ships. I did a Google image search of small cruise ships, and I got some very interesting results. I discovered that some of the small cruise ships could be classed as the same size as ferries, and if small cruise ships did come into Dun Laoghaire they could use the two existing vacant ferry ports. This would make far more sense rather than wasting a huge amount of money which would be far better spent rejuvenating Dun Laoghaire.